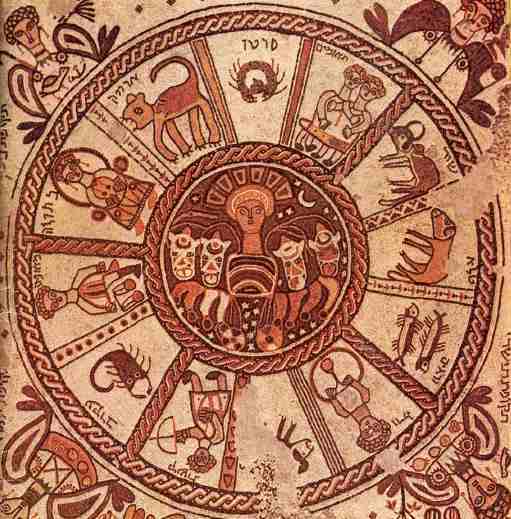 The creatures of the Zodiac cavort in a loop through the sky that takes us from midwinter to midsummer and back again. We are used to thinking of them as starting with Aries the Ram and ending with Pisces, the Fishes. But there is another way of ordering the Zodiac that can help you to think of the signs in a different kind of relationship to each other. This uses the traditional rulerships. at the top, and Capricorn, the midwinter sign at the bottom. instead of the more usual, ascendant. These pairs move outwards through the signs in a circle with Cancer and Leo at one meeting point, opposite to Capricorn and Aquarius at the other. The rulerships are moving outwards through the solar system known to the ancients. You can see the connections between these signs too, even though they may not necessarily share qualities or elements, which are the usual ways in which we group the signs. It also shows why the mutable squares can be easier to deal with than other kinds of square. They have a rulership affinity. It also shifts the midway points from the winter and summer solstices to about January 21 and July 21, which are, as we know, the most intense moments of those seasons, the depth of winter and the peak of summer. Really at midsummer it feels as if the summer is beginning not in its prime. You might want to think of midlife like this too – there’s a cheery thought. Another way of looking at the calendar is like this.